Against almost all advice I have ever read I decided to buy a Vulcan. 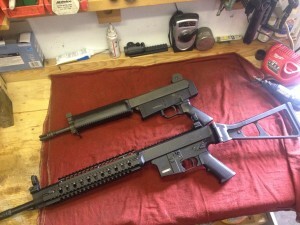 This particular “Weapon” (I use that term lightly) was sold as a parts gun. It was said to have light primer strikes and failure to extract. 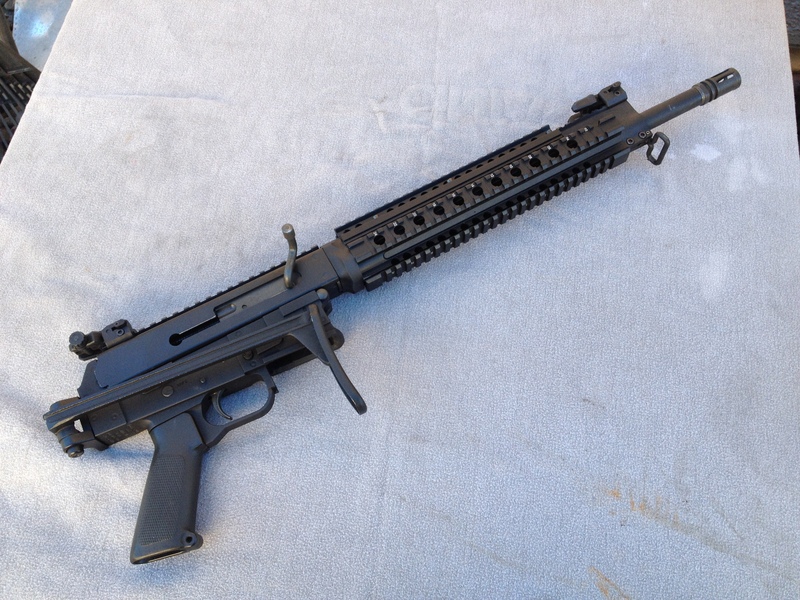 It also had no locking mechanism for the folding stock. For the price I considered this gun to nothing more than a collection of spare parts. I decided to field strip it and see if it was as bad as the one the guys at GunLab had. 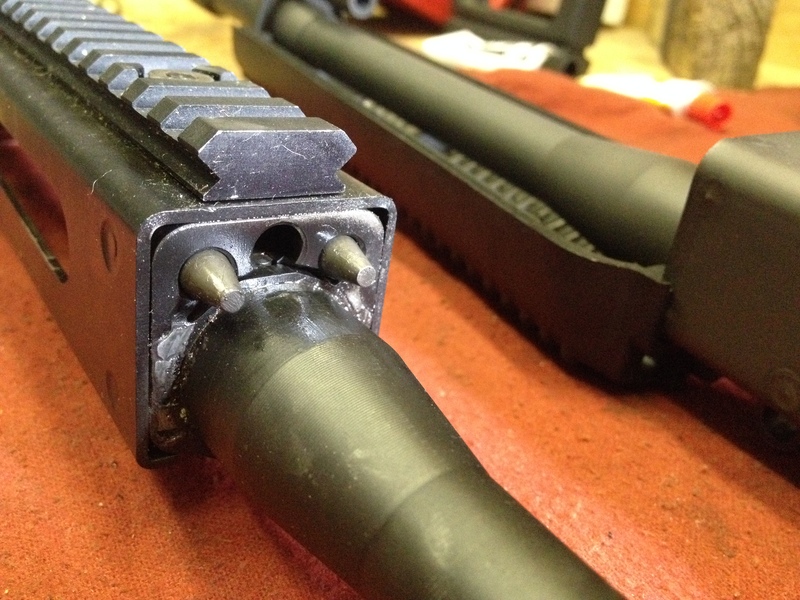 Well, it would not come apart and I had to resort to removing the large allen screw that is loctited in the rear of the lower receiver. Turns out that they did not completely remove the weld slag form one of the holes that the guide rods slide in and you could not push it far enough forward to open up the action. This was as far as they would go. I cleaned up the hole and now she works better. I put it all back together and it still wouldn’t come back apart. 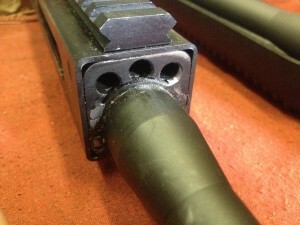 The railed hand guard also interfered with the guild rods and had to be massaged to clear. Now at least I can take it back apart. Before we move on I wanted to point out how Vulcan made this rifle. 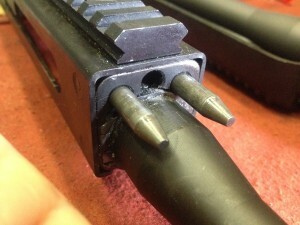 It appears that a standard AR-15 barrel was modified then pressed into the trunion and welded in place. 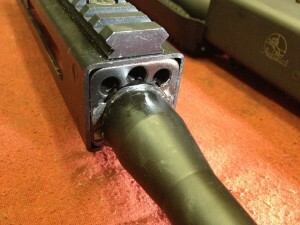 The trunion is not as complex to machine as the AR-180B and is much simpler than the original AR-180. It is worth studying for the home builder or someone thinking of building a derivative. I would hope that the workmanship quality shows improvement over these guns. That should not be too hard. Also something positive to say about Vulcan is the design of the bolt carrier to charging handle interface. 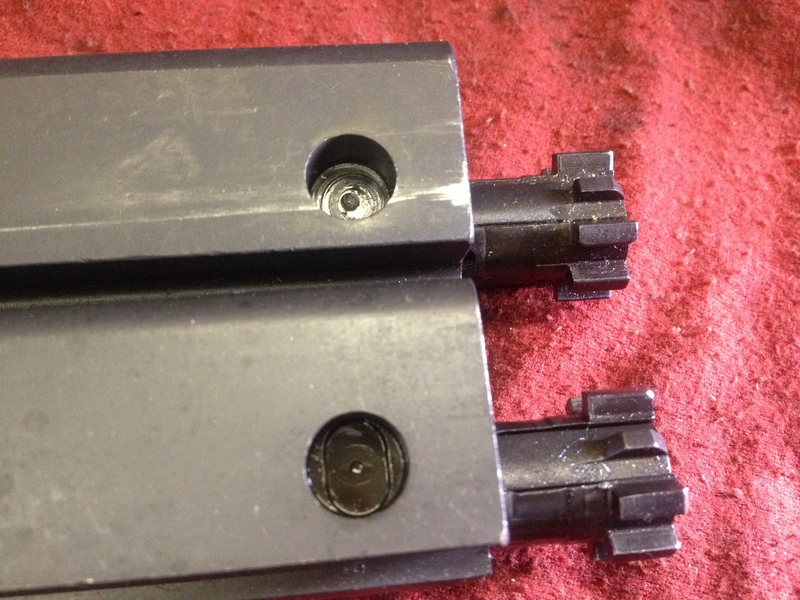 It looks like a much easier way to manufacture both pieces with the use of an end mill to cut the slot on the bottom then the hole. I think others could learn something from this design as well. 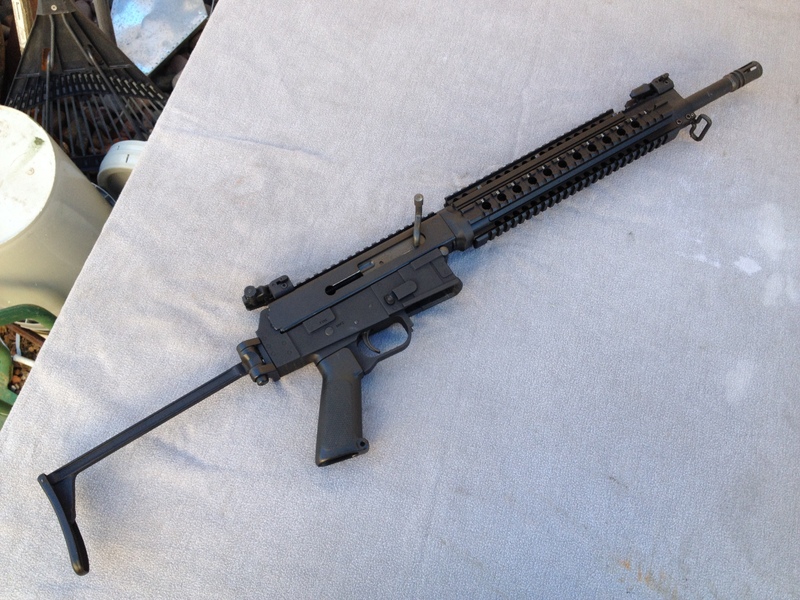 I then wanted to see if the NDS-18S lower would attach to this upper and it did. There were some misgivings however. 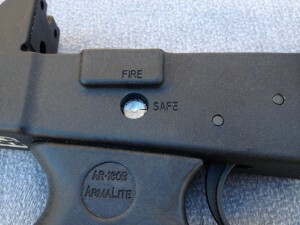 The AR-15 lower that Vulcan modified is shorter than an AR-180 and the distance from the pivot pin to the hammer pin is the main problem. To counter this Vulcan modified the bolt carrier by machining a slot and grinding a new radius in the bottom. 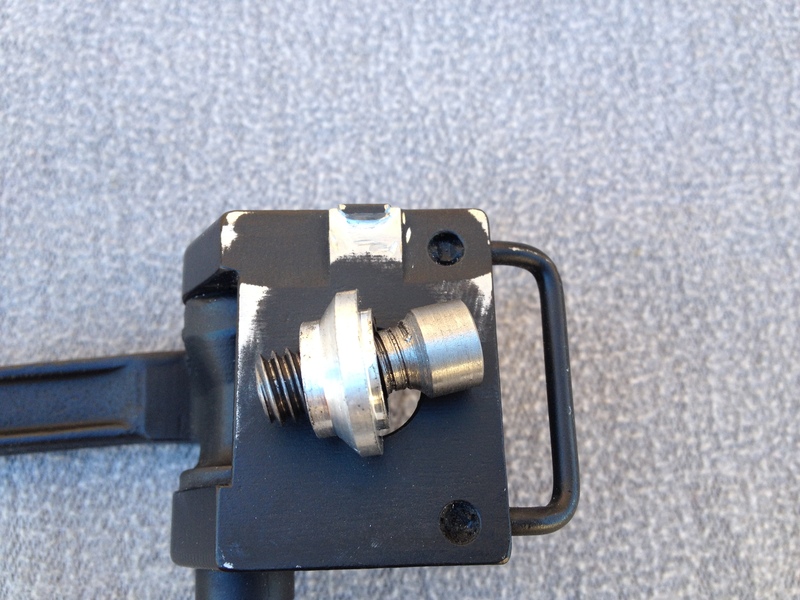 Even with this, the hammer was not striking the firing pin on the face. When I installed the NoDak lower it did. 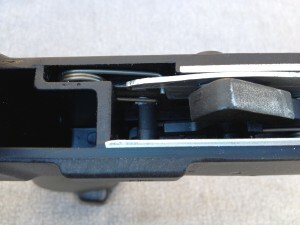 The relationship of the magazine to the barrel extension seemed to be about the same to my eye so even though there was a gap at the rear of the receiver where the lower attached, I decided it was worth trying. 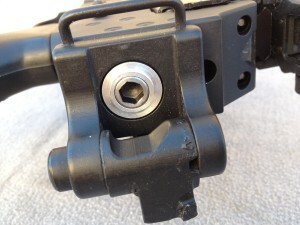 I took it out shooting when I went to test fire the AR-180B Shorty and with the original lower it had failure to fire, failure to extract, and failure to eject on about 4-5 out of 10 shots. With the NoDak lower you can see the results in this video. Next when I got home I decided to make an adapter to install a VZ-58 folding stock on this lower while it was on the Vulcan. A little lathe work and file work and she is ready to roll. 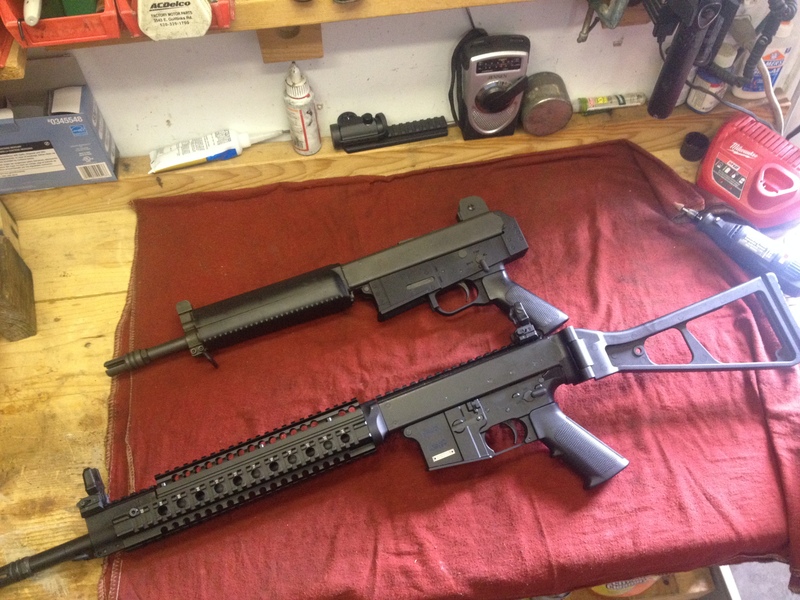 I then saw my abandoned AR-180B lower sitting in the corner of the safe and decided I needed to put these two together. 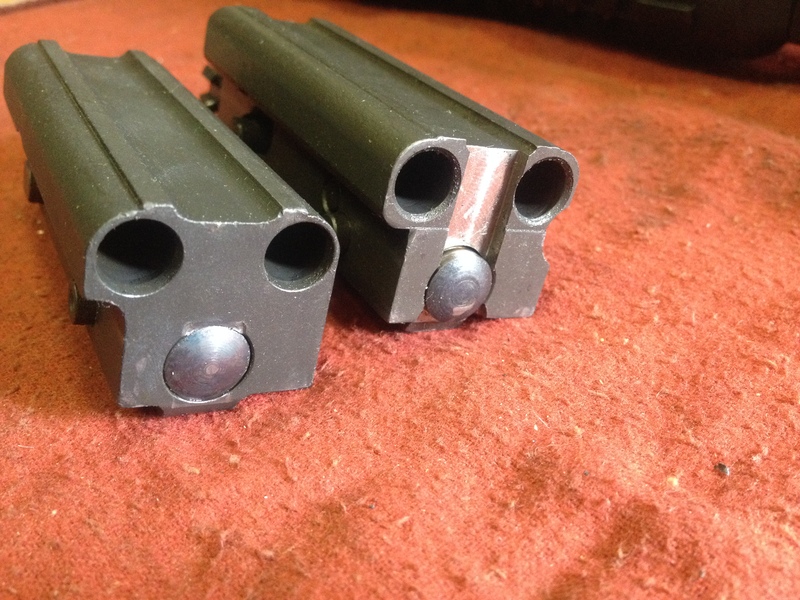 As bad as some have bad mouthed the Bravo lower, I have never had a problem with it. 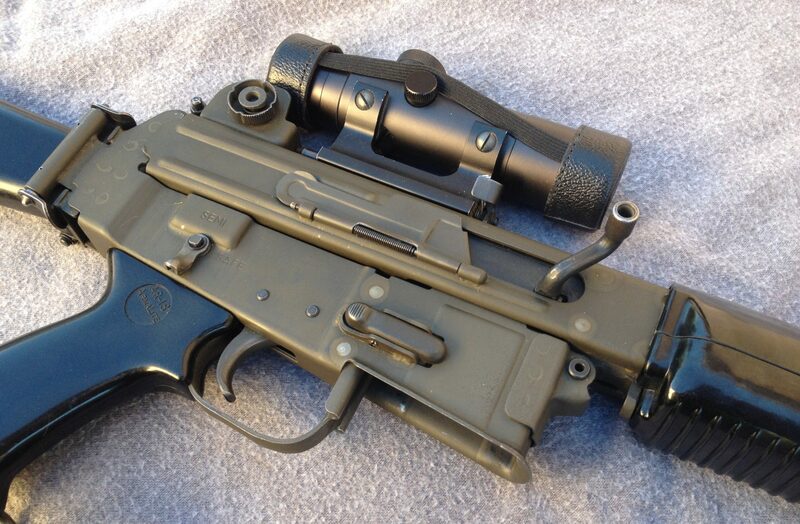 And it is vastly superior to the Vulcan lower. 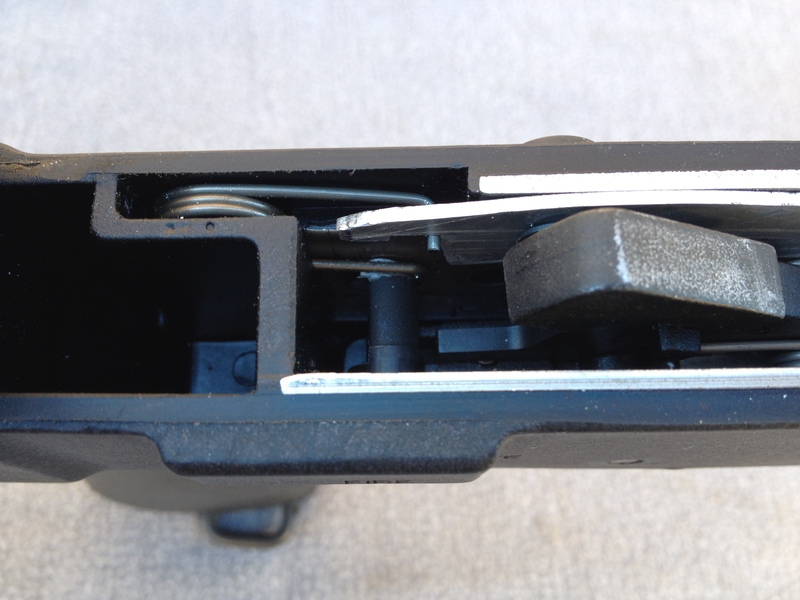 The only problem with the Bravo lower is it uses different safety and bolt hold open parts. I decided that there was enough meat on the safety that I could modify it until can make or buy something different. Again a little dremel and file work and I had a functional safety. Next problem is that the bolt hold open also holds the safety retaining spring in position. 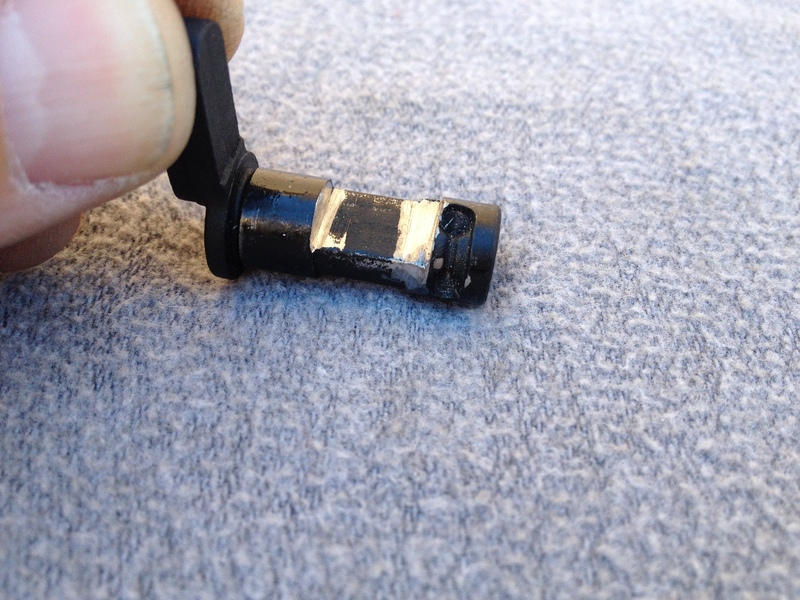 I didn’t have the proper size steel on hand to make a complete bolt hold open but I had some aluminum that I made into a spring retainer. The gun has no bolt hold open but thats not a deal killer for me. 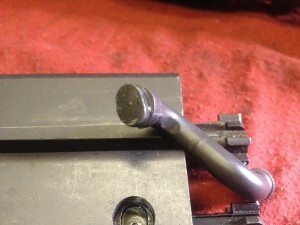 I’l fab up a complete bolt hold open out of steel next time I make it to the metal supply house. 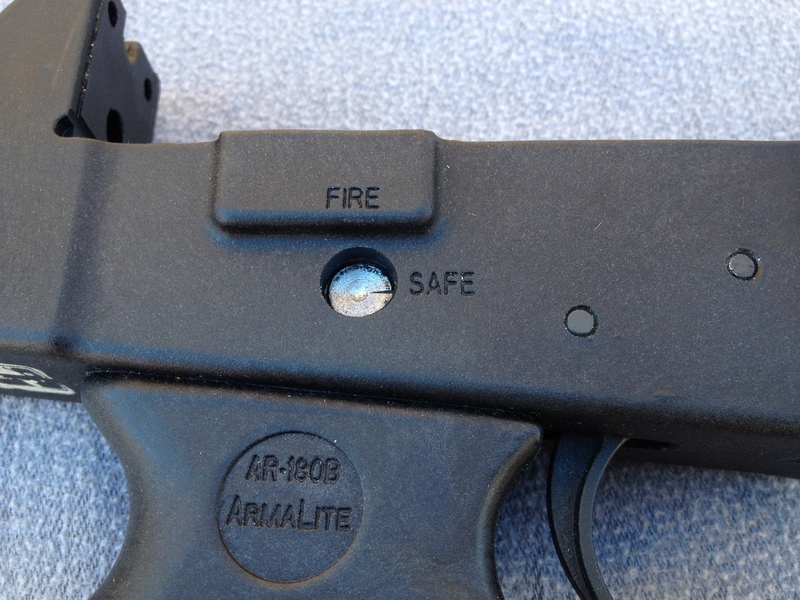 You can see that the safety is not as long as the original but it does just catch the hole so it stays centered. My original intent was to center drill the safety and turn up an extension that bolted on. It just laughed at my center drill. I’m either going to weld an extension on or anneal the safety so I can drill it. 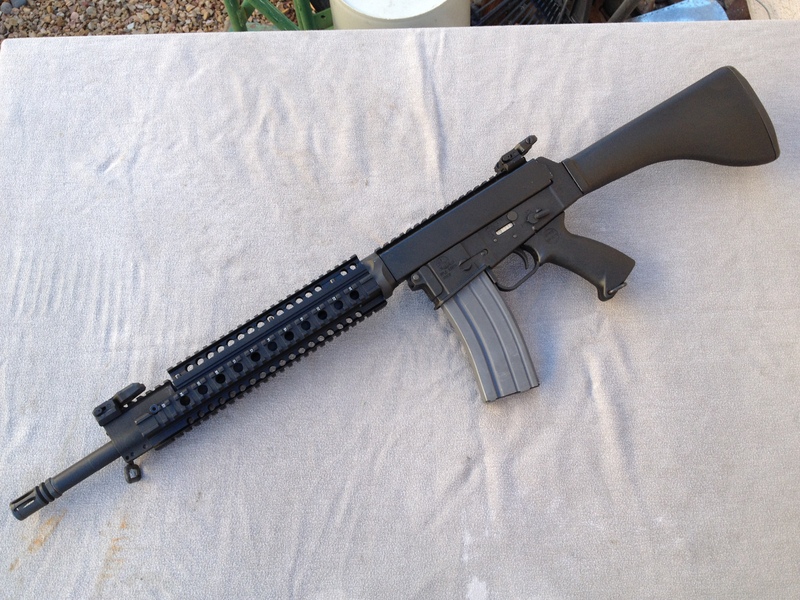 For now it works on the NoDak lower and I just have to get to the range to test it on the AR-180B lower. I don’t foresee any problems but these are all the parts out of the original Vulcan lower that had so many issues. I will keep you posted. I like what you did to the Vulcan rifle. Okay if I post a like from my site to yours on this. Now I need to buy a Nodak lower. Thanks for the post. You may link back to my site anytime.